Patrick Mullen, owner and artist of Fire River Art Glass has had a love affair with glass most of his life. Born in Ohio, Patrick came to California in the mid 70's and started his glass career with the art of stained glass. Looking for a more unique and creative style to add to his stained glass pieces, Patrick began to explore the world of hot glass. In 1995 he moved to Sacramento to open his own studio-Fire River Art Glass. Patrick's work has grown in scale as well as quality. 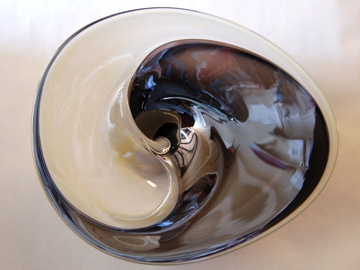 He offers a large line of art glass ranging from production pieces to one-of-a-kind art glass. His favorite art pieces to create are his new line of glass lamps- all individually hand blown. His work has been recognized in numerous juried shows and can be found in many respected galleries throughout the United States. Patrick has taught many workshops in contemporary glass techniques, including one month-long workshop in the Hawaiian Islands. Currently, Patrick is teaching glass blowing classes at his studio, twice a month. Visit www.fireriverartglass.com for more information.